Miller Nature Sanctuary is a well-hidden, state nature preserve in Highland County. It has three miles of trail that go past interesting geological features. 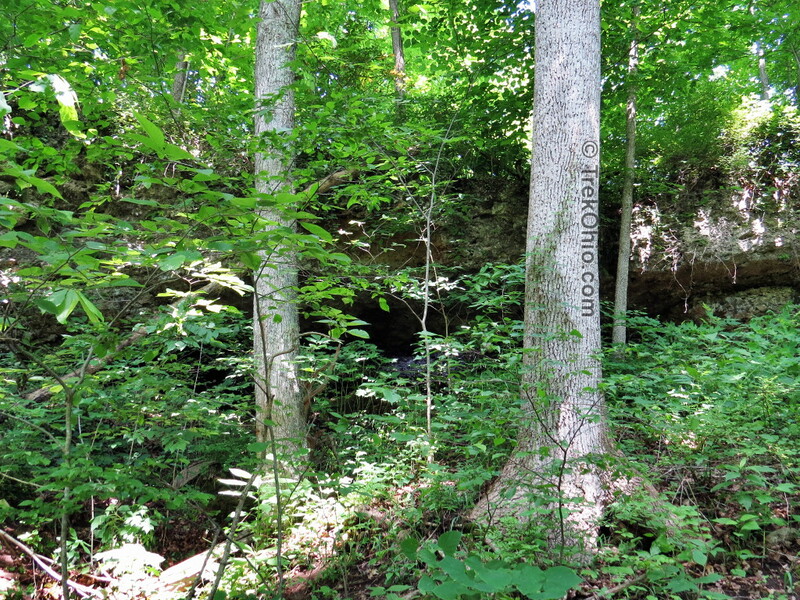 It’s named after Eugene and Henrietta Miller, the couple that donated the land. 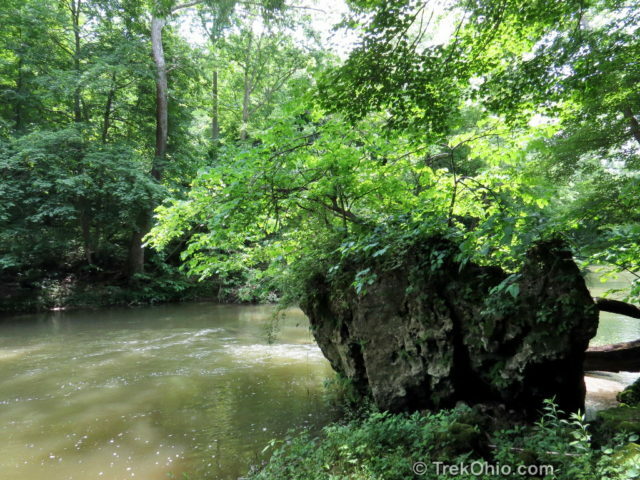 The preserve is located on Rocky Fork Gorge just upstream from Highlands Nature Sanctuary. The preserve’s trails take you from the top of dolomite cliffs to the edge of the Rocky Fork Creek and back. 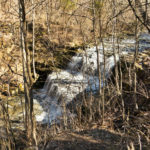 In addition to cliffs and large slump blocks, the preserve includes three natural stone arches and several seasonal waterfalls. 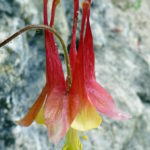 If that’s not enough, its also a great destination for viewing spring wildflowers. The preserve was formerly a permit-only preserve so the entrance is nondescript. It consists of a small, paved parking area and a narrow one-lane road with a small gate at its entrance. Only after you’ve entered the parking area, will you notice a brown sign announcing the preserve. The gate was open the day we visited, so we drove half a mile down the road to a larger grass parking area (if the gate is closed, ODNR notes that you can park at the entrance and walk in). 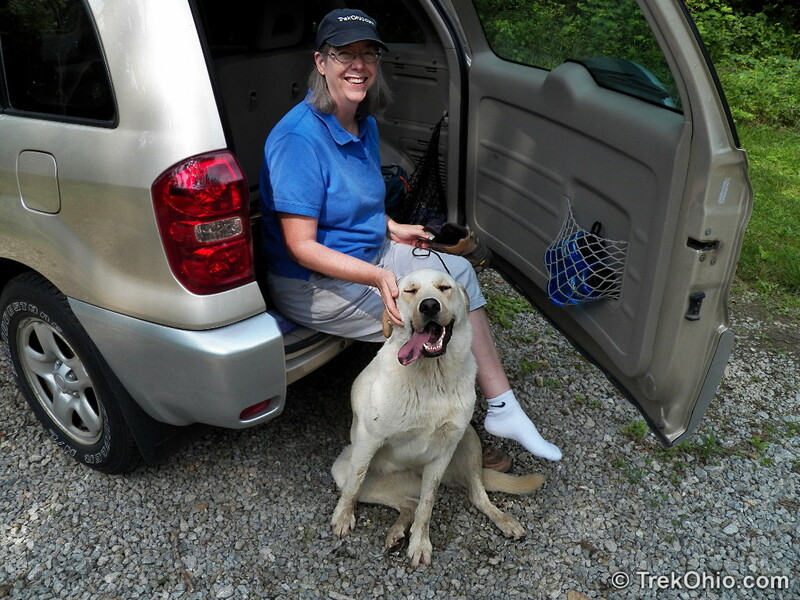 We parked and began our usual pre-hike preparations. It was then that we met our self-appointed guide who made an appearance from the woods, galloped up and slobbered on us. After introducing herself, she ran over to the trailhead, and looked back meaningfully (as in “Come on – adventure awaits you!”). We continued with our preparations, and our guide disappeared down the trail. 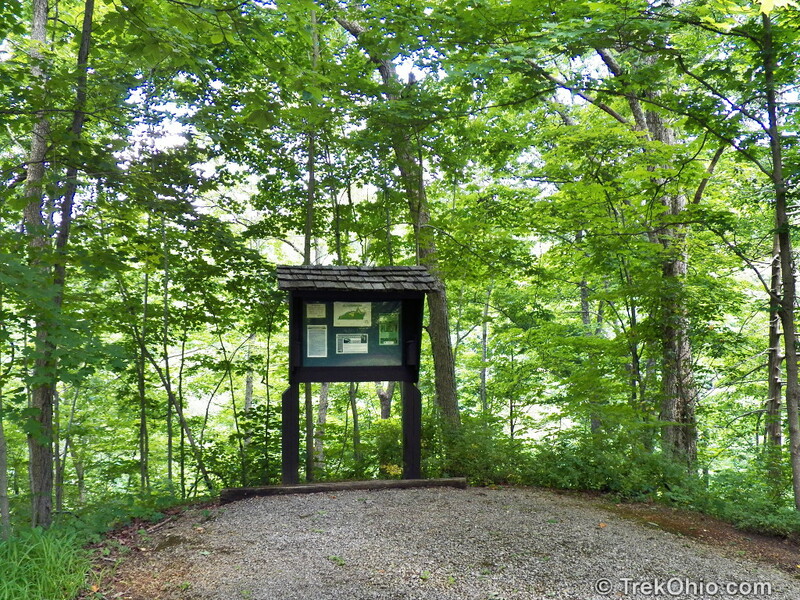 Near the trailhead is a bulletin board with a map. The trail system consists of three loop trails. 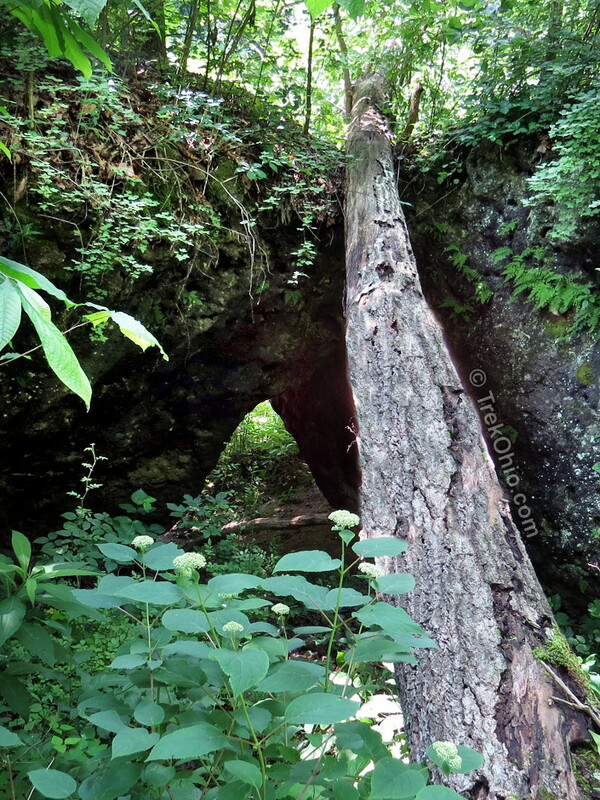 The smallest is the Arch Trail that leads down to the creek. The Tuliptree Trail follows a tributary of Rock Fork Creek up into the hills. 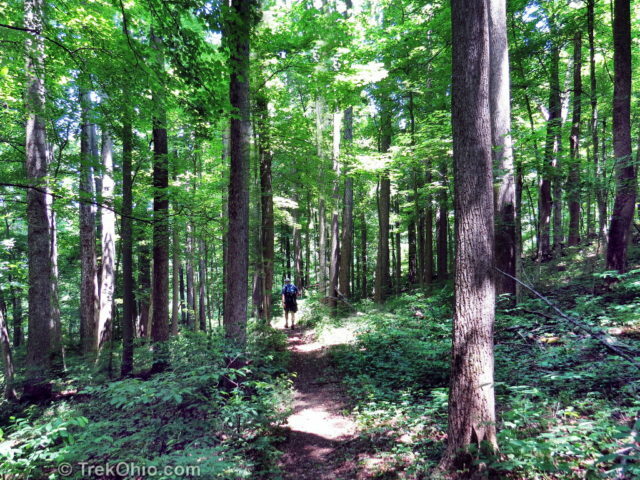 The longest trail is the Falls Trail which parallels Rocky Fork Creek and is named after a seasonal waterfall visible from the trail. The preserve’s kiosk is a considerable distance from the entryway of the preserve. 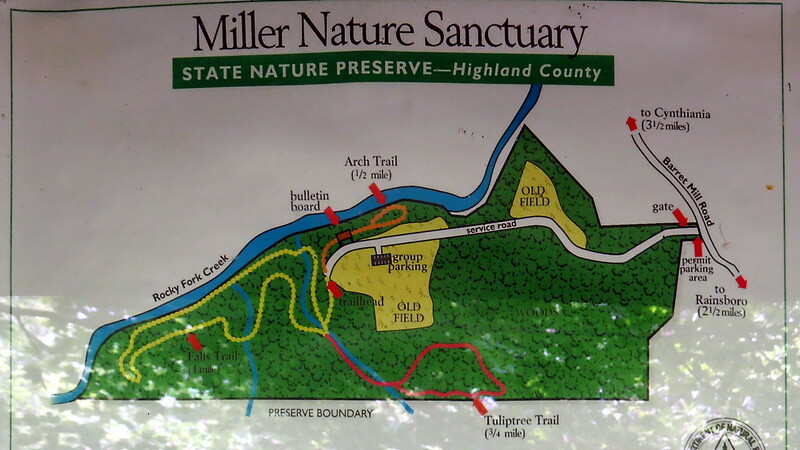 Trail map that was posted on the preserve’s kiosk. 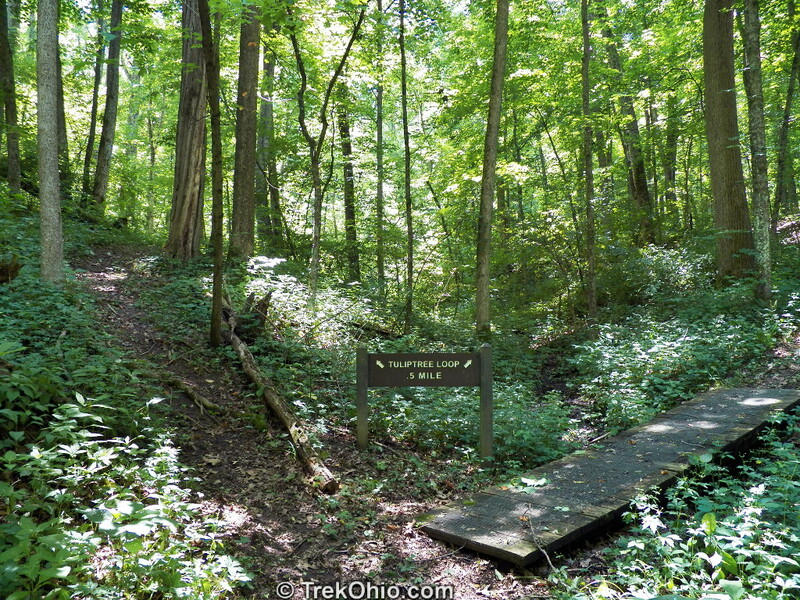 The map is oriented so that the Tuliptree Trail (the one the farthest from the creek) is on the bottom. GPS trace of our hike; Tuliptree Trail is on the far left. 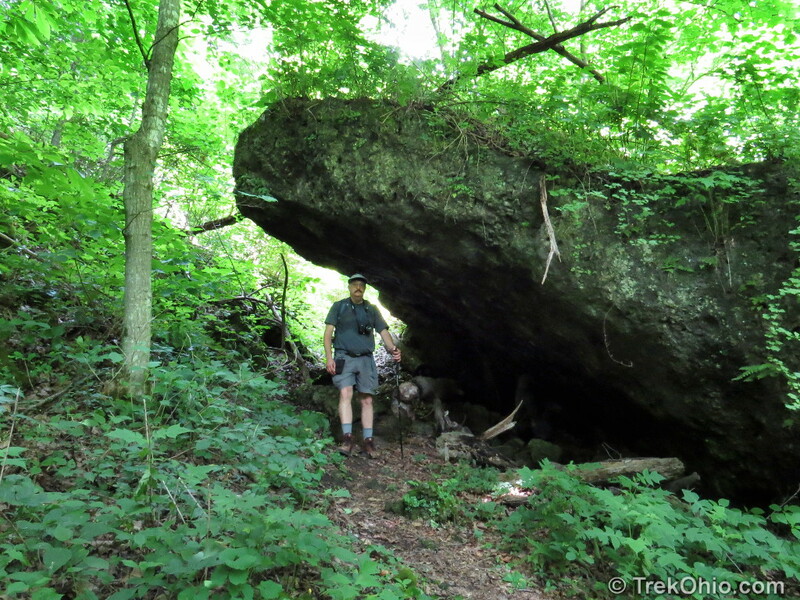 We started with the ½ mile Arch Trail. The trail descends to the creek passing two stone arches. Our guide reappeared near one of the stone arches. In the interim she’d gone for a swim in the creek. She ran through the arch and looked back at us to make sure we didn’t miss this geological feature. 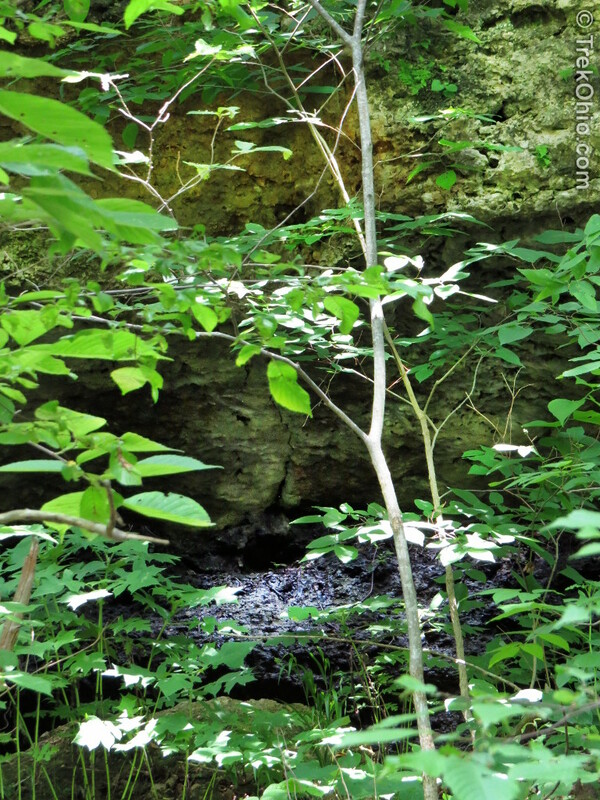 A number of slump blocks were also at the creek’s edge. 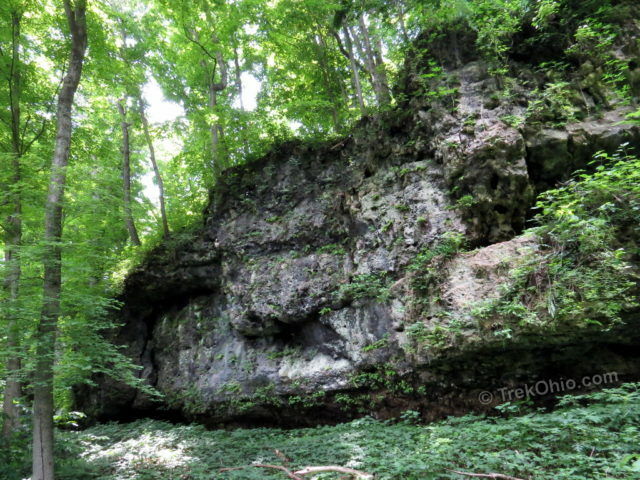 The slump blocks were once part of dolomite cliffs, but once fractures in the rocks became sufficiently large, chunks broke off and gradually slid (slumped) downhill toward the creek. Had there not been a photo describing the feature in the photo below as a “natural bridge”, I wouldn’t have realized that it, too, is a natural arch. Apparently erosion has cause the dolomite outcropping seen below to fracture and split off from the dolomite behind it. In addition the earth below it has also eroded, and so one can think of it as being a natural bridge. That said, it’s not one of our state’s most spectacular bridges. 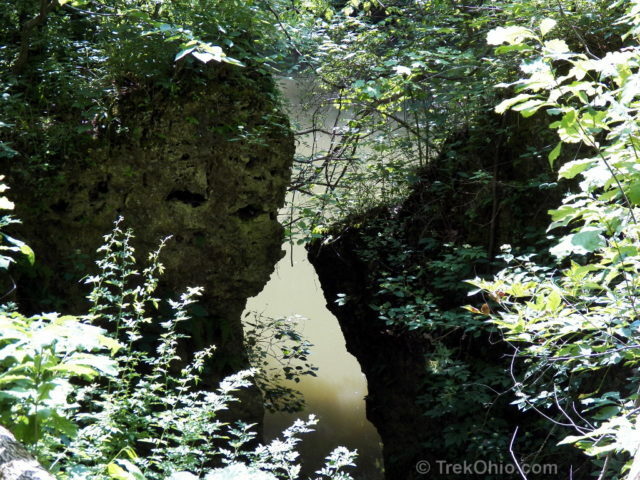 Surprisinly this is a natural bridge; the dark area in the center of the photo is the “passageway” under the bridge. 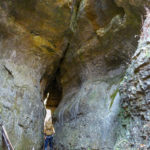 Zooming in on the “natural bridge” — admittedly not visually spectacular. The dark, wet muddy mess in the lower quarter of the photo is under the what’s thought of as a bridge. Our guide returned just as we were photographing some wildflowers. She decided we were boring (yes, it’s true!) 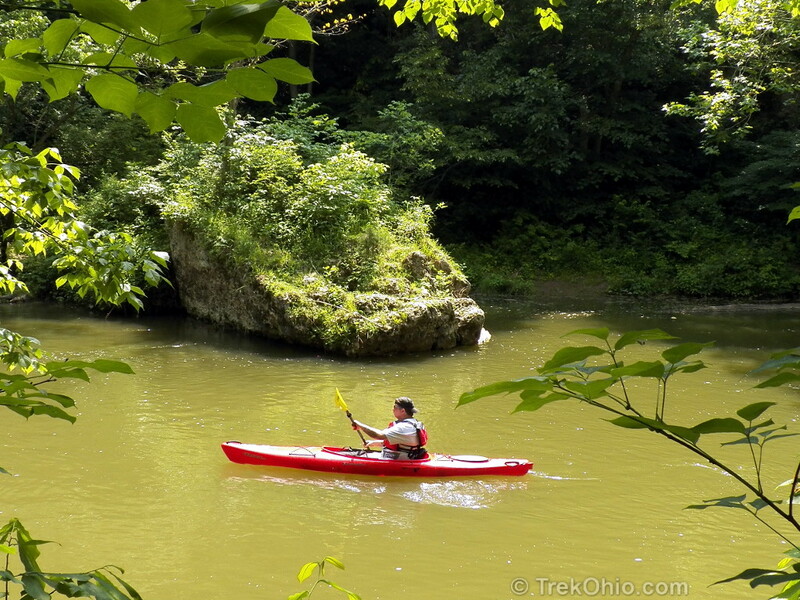 and ran back to the creek bank just as a group of kayakers were paddling by. Abandoning us, she lept into the creek and swam past the kayakers to take the lead and guide them downstream. 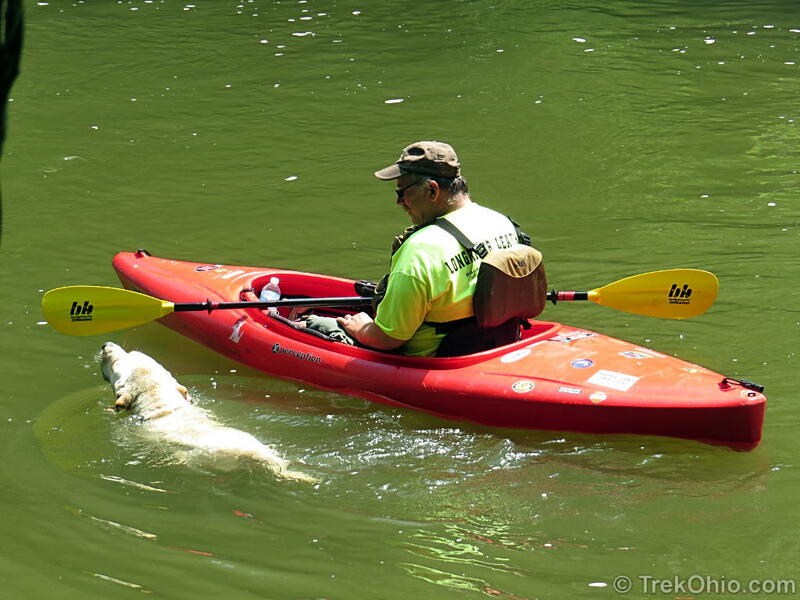 Our canine guide ditches us for the more exciting company of some kayakers. 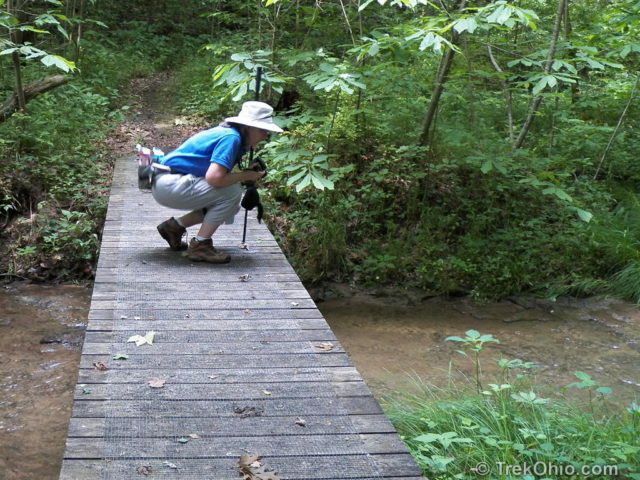 We finished the Arch Trail loop and continued onto the Falls Trail. 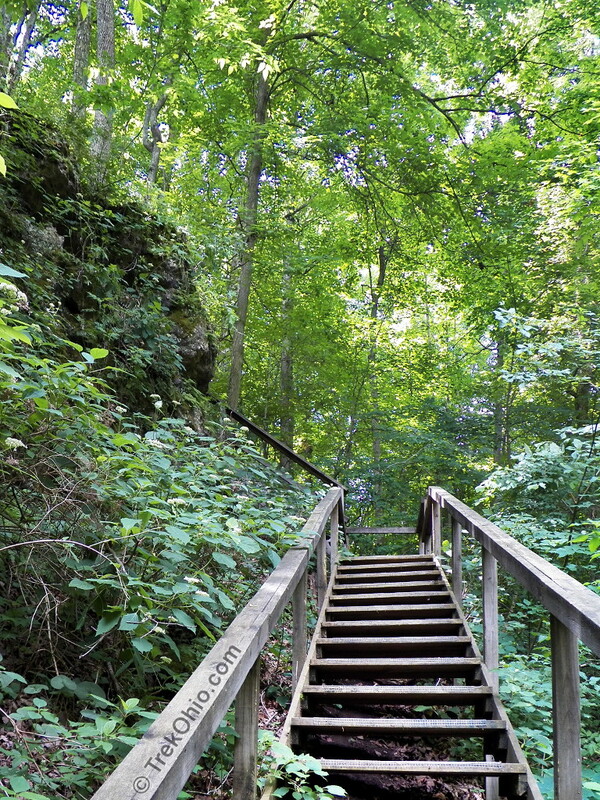 This trail descends down to the creek, parallels the creek and then ascends the cliff via a series of wooden stairs. It then follows the cliff rim leading back to the start. Along the way were a couple of seasonal falls, views of the creek, the dolomite cliff wall, and quite a few large slump blocks. 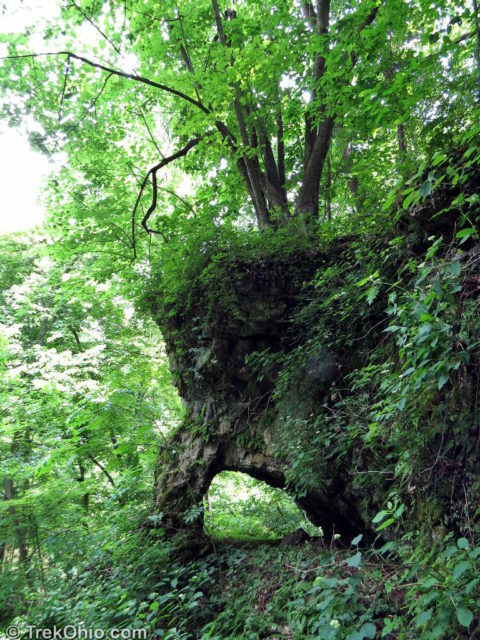 At the end of the stair climb is the largest of the three stone arches in the preserve; an arch resembling the head of an elephant. The cliffs here are made of Peeble’s dolomite. It is similar to limestone, except it has more magnesium. It formed 400 million years ago when this area was positioned south of the equator on the floor of a shallow sea. 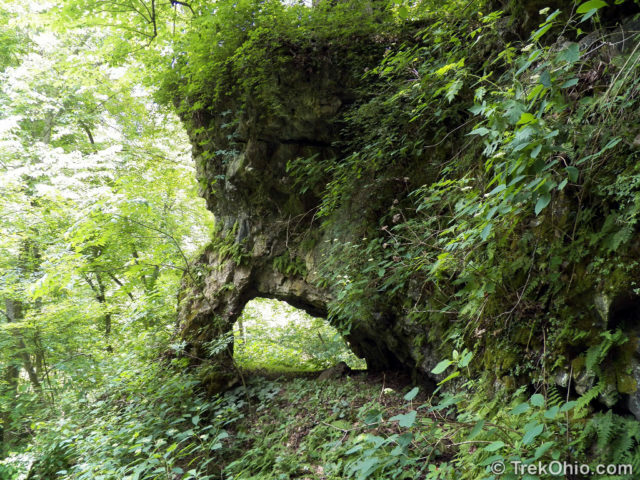 This natural arch reminds me of an elephant facing to the left. 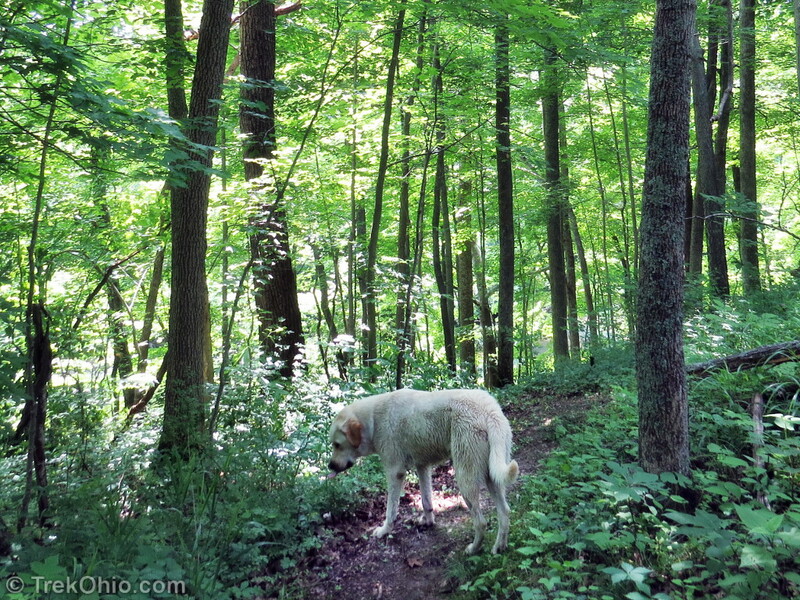 Our final trail was the Tuliptree trail. 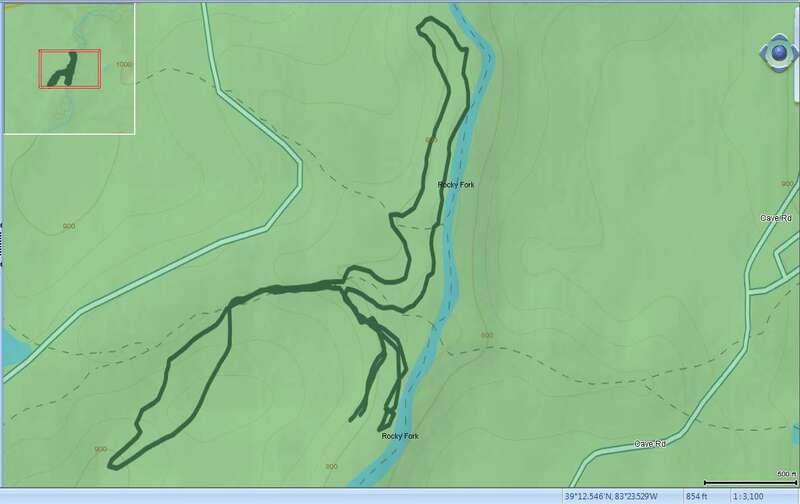 This follows a small creek and then has a loop that goes up, over, and around a hill. 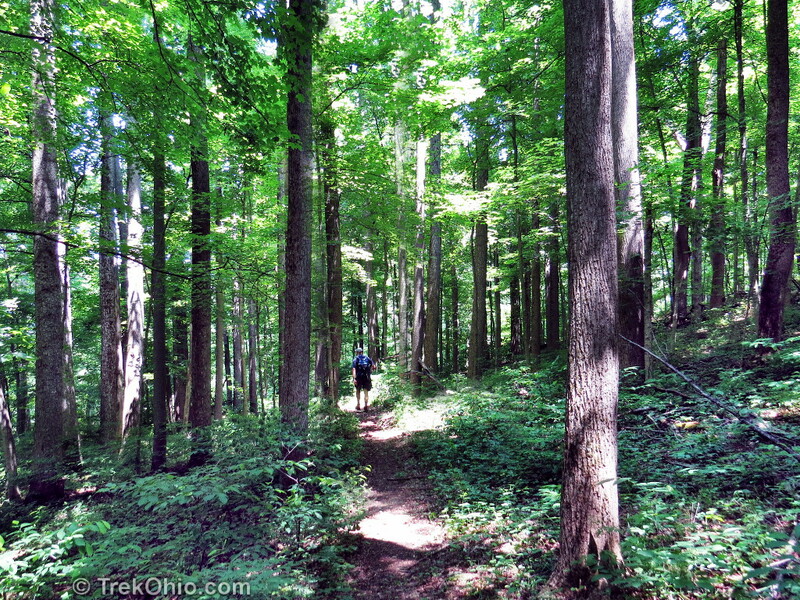 Like the other trails, this trail was through thick forest, but featured mature tulip trees which can grow quite large. The trail ended back at the intersection with the Falls Trail and then it was just short walk back to the parking lot. 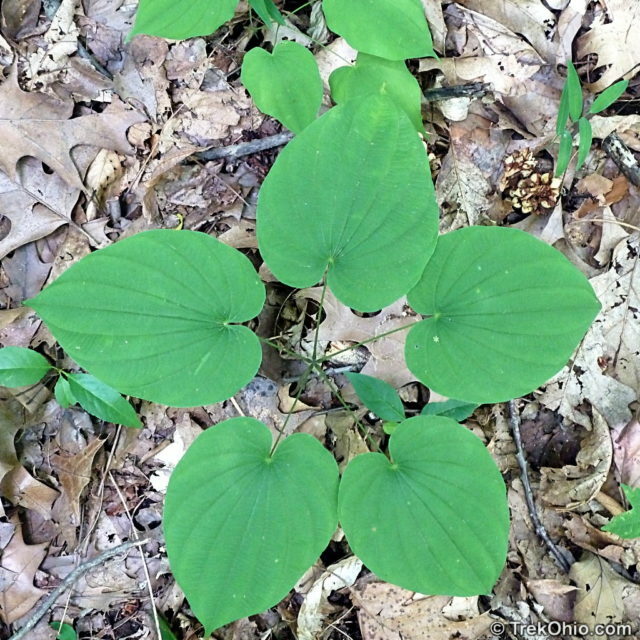 As mentioned at the beginning of this article, Miller Nature Sanctuary is well known for its spring wildflowers. However since we were visiting in mid-June, we missed out on this display. Nonetheless we still spotted some interesting vegetation. 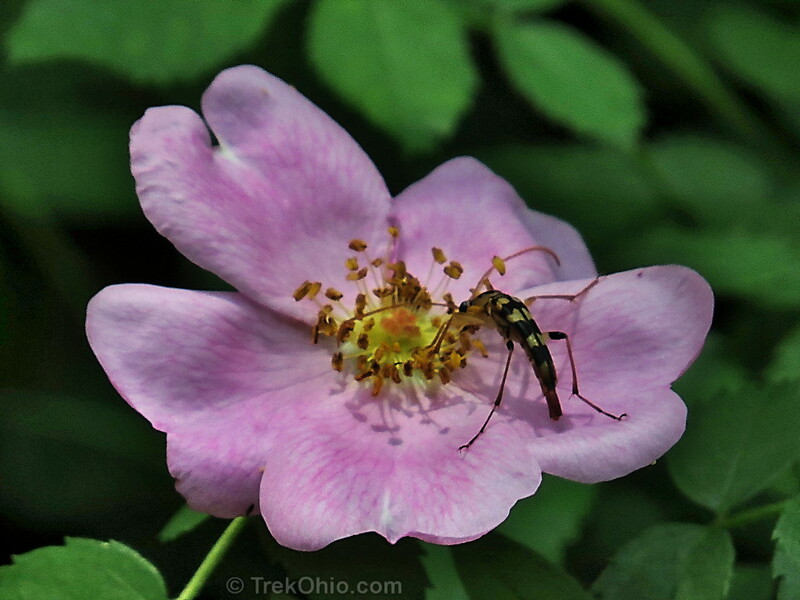 This is a wild rose (maybe a swamp rose) that’s being pollinated by an unknown bug. This whorl of five, heart-shaped leaves is wild yam (Dioscorea villosa). Although its tubers are not toxic, I’m told they have a very disagreeable taste. 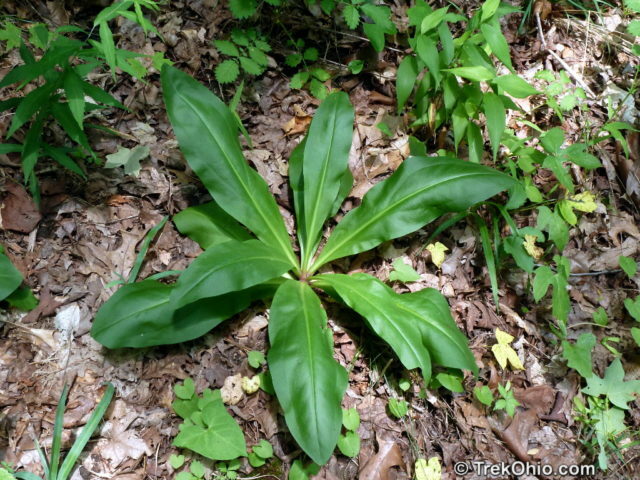 American columbo (Frasera caroliniensis). When blossoming a stalk (panicle) emerges from the center and grows as high as 7 feet. Fifty to one hundred blossoms emerge from the stalk. Eastern Ninebark (Physocarpus opulifolius). This is a native shrub in the rose family. 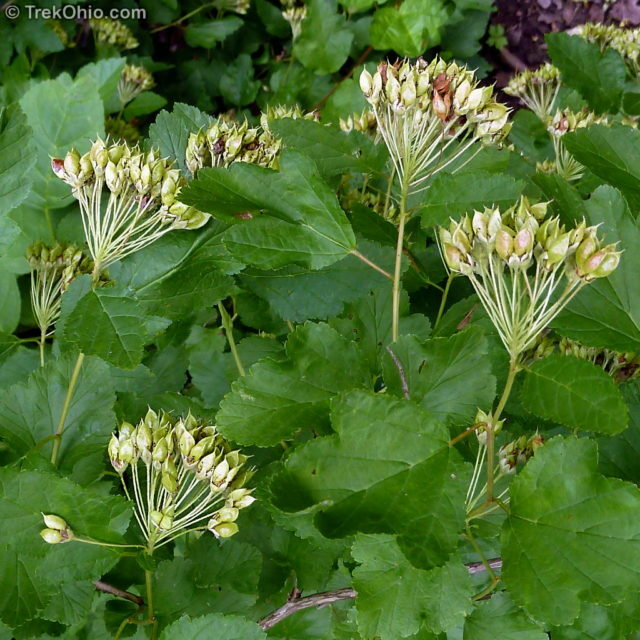 It’s a good landscaping plant with decent fall color, and as an added plus, deer don’t like to eat it. 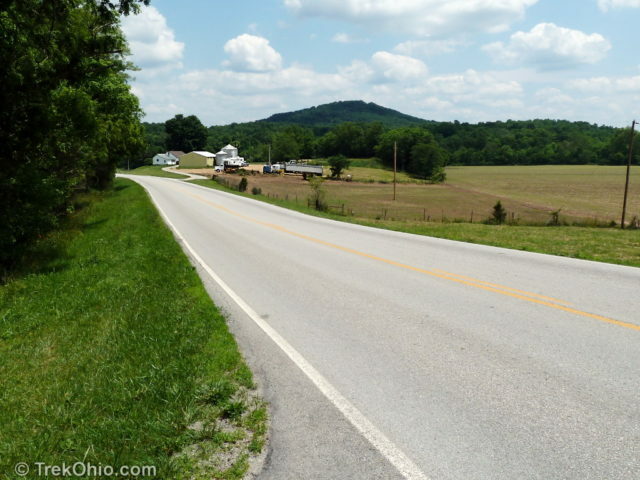 TrekOhio: Fort Hill — This is a 15-minute drive from Miller Nature Sanctuary. 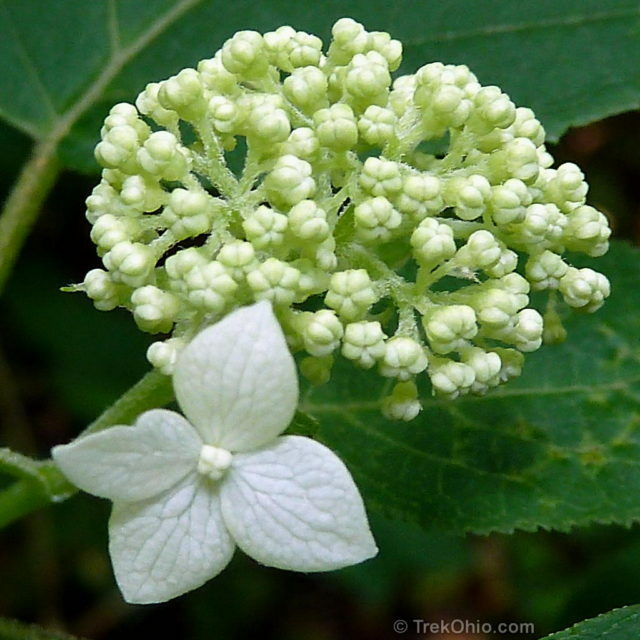 Note: Don’t confuse Miller Nature Sanctuary in Highland County with the similarly named Miller Nature Preserve located in Lorain County. 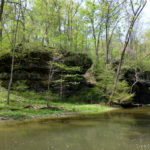 Share the post "Miller Nature Sanctuary"
What a beautiful, secluded place! Thanks for suggesting it! We went after some rain, so the waterfalls were flowing! We want to go back in the winter when we can see the rocks a little better. Beautiful! I just love petunias; it is fun to see a wild one. The arch formations are lovely. I’ve not heard of Peeble’s dolomite. 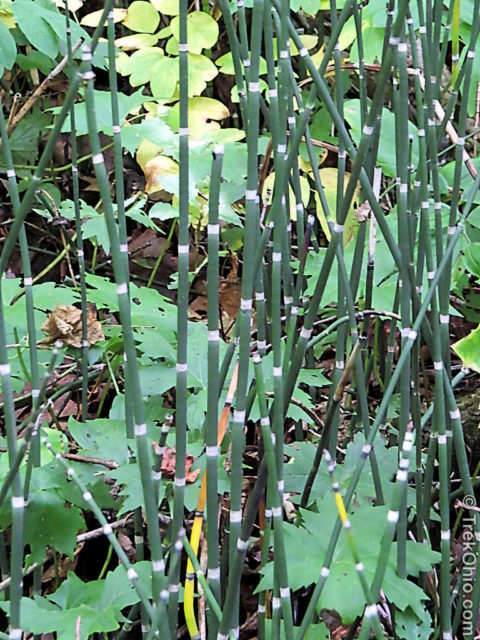 The scouring rush reminds me of bamboo. It sounds very hearty like bamboo. 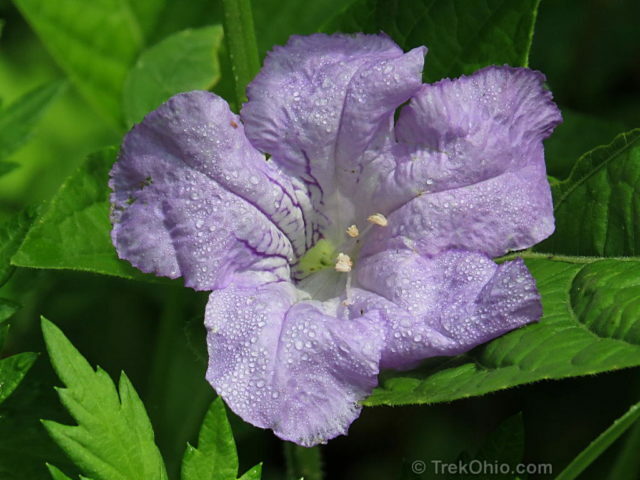 TrekOhio’s Reviews provide an alphabetical listing of all the parks for which we’ve published illustrated articles. These articles describe what our experience was like when we visited the park. Note that the publication date is listed near the top of the article. It is possible that renovations or other changes have occurred since the article was posted. Be sure to check the site’s official page for the latest updates. Our Home page lists our latest park reviews, nature articles, and other related information. Ohio Outdoor Activities and Events by Season — lists general things to do at Ohio’s parks and preserves throughout the year. 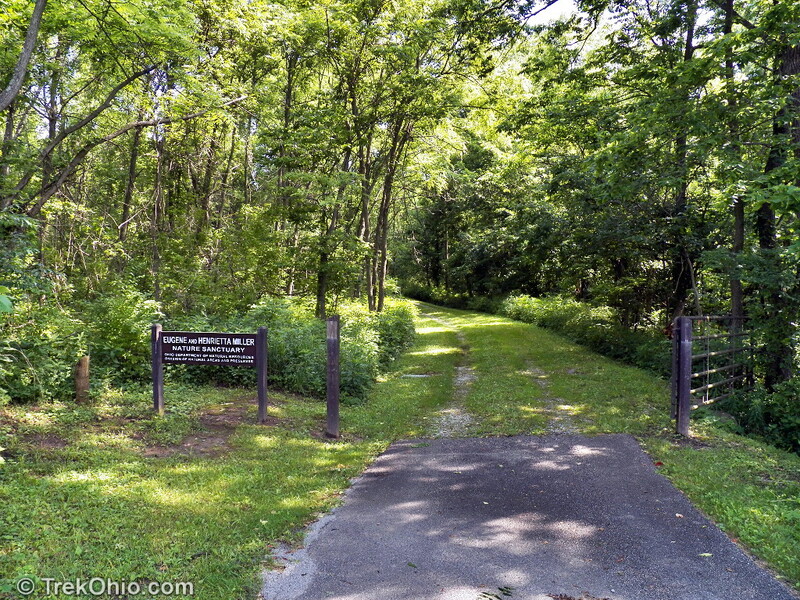 Buckeye TrailFest — May 16 – May 19, 2019 at Camp Widewater On The Maumee And Miami And Erie Canal; the festival commemorates the 60th anniversary of the Buckeye Trail, a 1,400-mile trail system in Ohio. The Ohio Dept. of Natural Resources (ODNR) is offering a Survey on Ohio Trails. Your input will influence ODNR's next plan for recreational trails of all types. 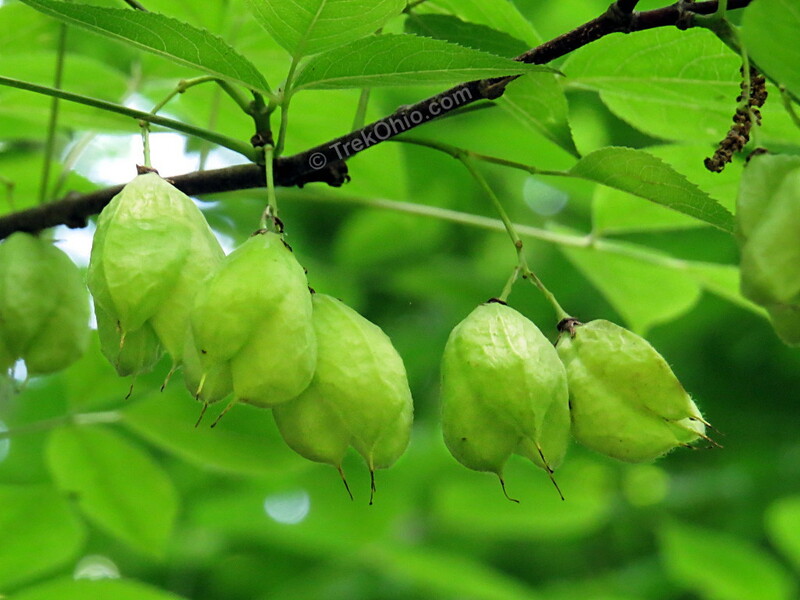 TrekOhio is an Amazon affiliate. Help support TrekOhio by making purchases through Amazon links on this site.